An image by celebrity photographer Mary McCartney illuminated London’s City Hall earlier tonight (Saturday 17th October). 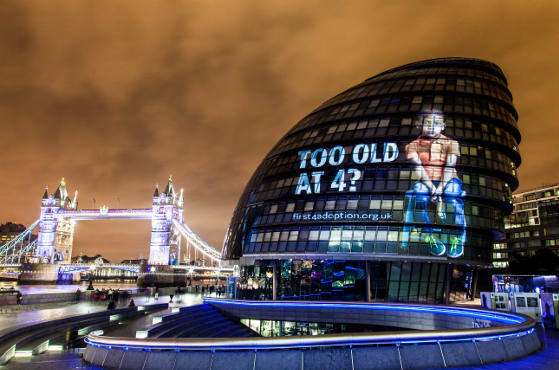 The projection, of a four year old boy and the caption “Too Old at 4?”, launched National Adoption Week which starts on Monday. National Adoption Week aims to draw attention to the children waiting longest for adoptive families whose average age is just 4 years. There will be more projections taking place during the week across the country in Bristol, Blackpool, Liverpool, Manchester, Newcastle, Leicester, Birmingham, Bolton and Leeds. Find out more about the projections.